Ce séminaire aura lieu en AMPHI 80 (RdC BU) de 13h à 14h. Alessandra Montanini, Maître de Conférences à l’Université de Parme (Italie), présentera ses travaux sur la réévaluation de l’origine et de l’évolution de l’ophiolite de Nouvelle-Calédonie, basée sur les résultats géochimiques récents sur les éléments Sr, Nd et Pb. Dr Alessandra Montanini is an associate Professor in Petrology at the University of Parma (Italy). Her main research interests are mantle petrology, petrogenesis of ophiolitic sequences from different geodynamic settings and tectono-metamorphic evolution of continental lower crustal rocks. The New Caledonia ophiolite hosts one of the largest and best preserved mantle sections in the world, offering a unique insight into upper mantle processes. Mantle lithologies are dominated by harzburgites, with minor lherzolites. In addition, the New Caledonia ophiolite includes a rare example of crust-mantle section built in a nascent arc environment, providing the opportunity to investigate the first stages of magmatism in an intra-oceanic arc setting. Here, I will presents the main results of a 5-year lasting collaboration among Montpellier, Parma and New Caledonia Universities, aimed to investigate the origin and evolution of the New Caledonia ophiolitic sequence. 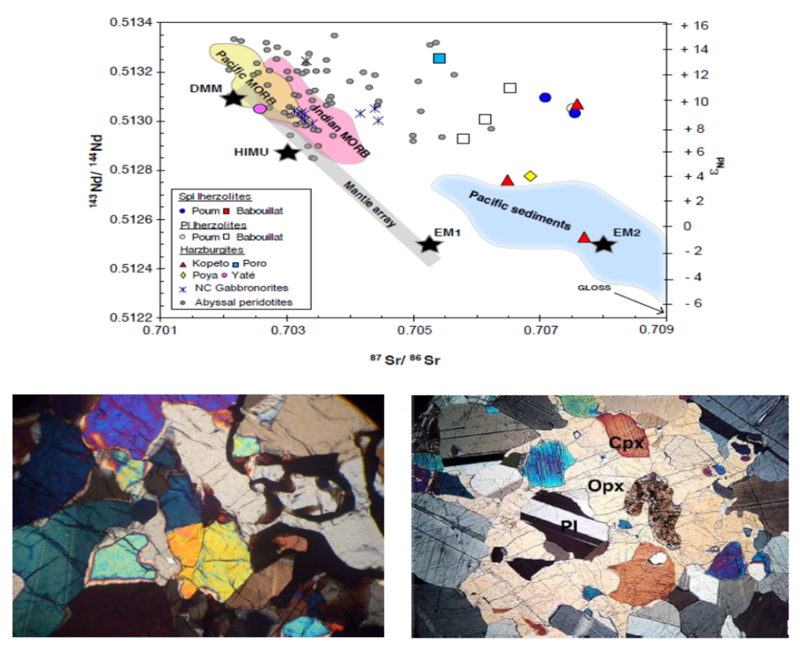 According to the recent studies, geochemical and isotopic compositions of the lherzolites attest a moderately depleted signature originated in a mid-ocean setting, i.e. in a marginal basin formed before Eocene subduction. Conversely, the geochemical signature shown by the harzburgites reflects the evolution of a highly depleted fore-arc mantle wedge contaminated by fluid inputs in the subduction zone. The mafic rocks of the intrusive sequence derived from emplacement in the lower fore-arc crust of primitive, non-aggregated, magma batches which were originated by melting of a refractory mantle source, variably modified by slab fluids, during the first phases of arc formation.